In the spring of 2000 the dot-com bubble burst. Office vacancy rates began to rise throughout the southeastern corridor. Companies that only a year before had been flush with venture capital and overvalued stocks were themselves unable to cover financial obligations because of depleted or nonexistent capital. Layoffs swept through San Francisco’s eastern corridor. Bigstep.com laid off more than 25 percent of its staff in December. Pets.com, once seen as the rising star of the world of digital commerce, went out of business in late 2000. All told, 210 Internet companies folded nationwide in 2000, taking with them an estimated fifteen thousand jobs, many of them located in the Bay Area (Ashford 2001). The boom had turned to bust and the acute phase of the crisis began to subside. 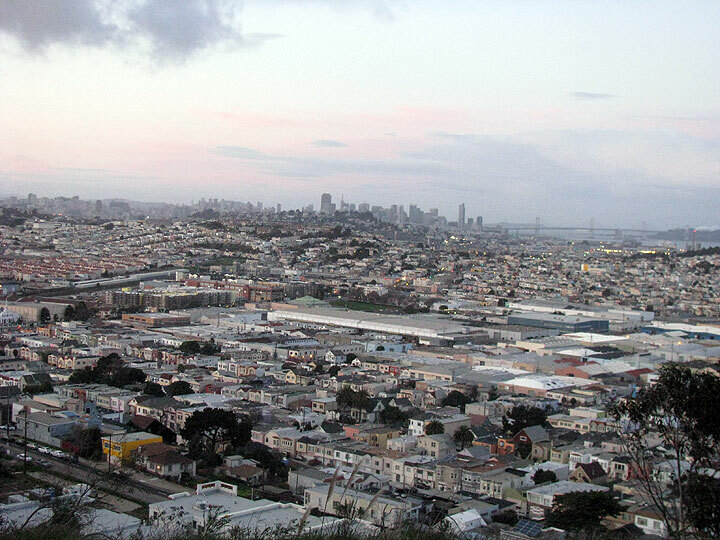 This photo from Bayview Hill in January 2010 shows the southeastern neighborhoods of San Francisco stretching northward towards downtown. Victories by progressive candidates in the 2000 runoff elections shifted the [[Mission Anti-Displacement Coalition|Mission Anti-Displacement Coalition’s (MAC) focus to the preparation of a set of interim zoning controls. Organizers met over the 2000 Christmas season to set about drafting the new controls. Two new land use categories were designated to more accurately differentiate uses. Information Technology Services included multimedia, software development, web design, electronic commerce, research and development, information technology, and other computer-related uses that would henceforth be categorized as office space and brought under the annual citywide cap imposed by Prop. M. Community Services was defined as “nonretail use” that included “executive technical, management, clerical, and administrative support for the provision of social, health, housing, employment, economic, legal, cultural, or arts services to the general public, principally to persons of low and moderate income.” Additional stipulations included banning all new loft development or conversion for six months, the demolition or conversion of housing units to commercial space, and the conversion of single-room-occupancy (SRO) hotels to tourist hotel uses. In addition, subjected to conditional use review by the Planning Commission were all business service conversions of more than two thousand square feet in the Twenty-Fourth Street, Valencia, and Mission Street corridors (Mission Anti-Displacement Coalition 2001). Given that Districts 6 and 9 had voted overwhelmingly in favor of Prop L, Supervisors Chris Daly (District 6) and Tom Ammiano (now representing District 9) introduced interim controls based on MAC’s draft legislation that put a temporary moratorium on large office projects, live-work lofts, and market-rate housing with less than 25 percent of units designated for affordable housing. The board passed the controls in July 2001 (and renewed this legislation in July 2002). Also, MAC formed the Mission Anti-Displacement Project, or MAP, to serve as the coordinating body for the implementation of a neighborhood-level planning process to prepare a set of binding permanent controls. The decision to form MAP was done to preserve the political autonomy of MAC, which would continue to function as an independent community coalition not beholden to either government officials or foundation funders. MAP applied for, and received funding from, a variety of foundations, including Vanguard, Zellerbach, and the San Francisco Foundation, and used the money to pay staff to prepare detailed zoning and land use maps, hire consultants, analyze data, and prepare draft reports and final zoning recommendations. To ensure turnout at community planning forums set up by the San Francisco Planning Department, MAC’s affiliated nonprofits committed themselves to an extended process of organizing within their core constituencies to increase participation of otherwise disposed groups within the rezoning process (Quezada 2002; Pagoulatos 2002). Nonprofits and community organizations with staff dedicated to MAP—Mission Agenda, PODER, and St. Peter’s—allocated funds to do outreach to their base constituencies. Outreach and leadership trainings were expanded in the single-room occupancy hotels. Organizers identified designated leaders in buildings and supported them in taking on greater responsibility for on-site organizing and advocacy. MAC also did outreach to low-income renters and small Latino-owned businesses. Mission Housing developed a Mission Residents Advocates program, which provided leadership training to tenants residing in buildings under agency management. The curriculum was in Spanish, and the training sought to develop the abilities of building residents to more effectively identify problems and organize on their own behalf to demand improvements (Grande 2002; see also San Francisco Planning Department 2005). In each case there was an explicit attempt to integrate the development of independent political leadership skills within low-income groups into the Community Planning Process to ensure effective representation of these constituencies’ interests (Quezada 2002; Pagoulatos 2002). The first meeting convened by the Planning Department in the Mission District took place on February 12, 2002. Around 350 people attended. Participants were encouraged to articulate a broad set of priorities and social objectives—the type of neighborhood in which residents wanted to reside, indications of their foremost concerns and priorities, and the values that should guide the rezoning process—that would guide the design of actual land use proposals (Grande 2002; Miller 2002). The second and third meetings focused on transforming initial input into a set of actionable goals. Participants were divided into smaller groups, with conveners acting as facilitators of discussions that sought to move from inclusive statements of principles to specification of concrete outcomes achievable through land use controls. Community input helped the Planning Department develop three rezoning proposals that would form the basis for a set of working drafts produced over the following several years, as the rezoning options went through successive iterations. The first proposal represented the maximum possible retention of jobs in the production, distribution, and repair sectors (PDR). The second, most clearly reflective of the input from the MAC/MAP process, represented an attempt to achieve a greater balance between housing and blue-collar PDR-type jobs, while the third rezoning option represented the maximum allocation for housing. All three proposals were presented at the fourth meeting on September 17, 2002. The vast majority of those in attendance supported Proposal B (Mission Anti-Displacement Coalition 2005). This became the working template for subsequent efforts by MAC/MAP to craft additional proposals to address retention of community-oriented local businesses and social services, as well as the development of affordable housing. As the planning process progressed and the initial upsurge of neighborhood mobilization waned, MAC’s core cadre of committed activists became increasingly technocratic and absorbed into the regulatory minutiae of land use controls. While retaining its focus on mobilizing low-income residents, over time it became harder to energize this base. Relations with the Planning Department had become far less confrontational. Funds provided to MAP were used to undertake extensive land use mapping and rezoning analysis, which provided a basis for generating ideas regarding density exemptions to increase affordable housing construction. Proposals developed in the Community Planning Process were used by the Planning Department to develop the draft Rezoning Options Workbook that was released in February 2003, which fleshed out the three options presented at the September 2002 meeting (San Francisco Planning Department 2003). After some minor revisions and hearings before the Planning Commission, a new set of interim controls were adopted on February 12, 2004 (see San Francisco Planning Department 2006). MAC was by this time engaged in a “parallel” planning process that resulted in the issue in March 2005 of a draft proposal of the People’s Plan. The People’s Plan differed from Option B in the February 2003 Rezoning Options Workbook in requiring that land zoned for businesses and services include a local servicing component to give preferential consideration to local, community-oriented nonprofits; locally owned small businesses; and cultural organizations with demonstrable ties to the neighborhood. The People’s Plan further specified the need to increase affordable housing requirements through inclusionary zoning and promotion of home ownership opportunities that targeted existing Mission District residents (Mission Anti-Displacement Coalition 2005). The Planning Department continued to make efforts to solicit community input. Questionnaires were mailed to several thousand Mission District households, and planning officials conducted focus groups and telephone interviews with local neighborhood businesses. A citywide summit on industrial land use was convened and attended by more than two hundred people. Planning Department personnel held informational meetings, opened their offices to the general public, and conducted several open community workshops in four of the affected neighborhoods (San Francisco Planning Department 2005, 2007). The result, in August 2008, was a final draft proposal for a comprehensive rezoning of the city’s eastern neighborhoods (San Francisco Planning Department 2008). Approved by the Planning Commission and forwarded to the board, the plan called for a 15 percent affordability set-aside on new housing construction (as per the city’s existing Affordable Housing Program); this amount could be increased on projects that exceeded current height limits subject to a conditional use permit. These condos at left were built in the early 2000s in the area of the eastern neighborhoods slated for upwards of 30,000 new housing units. 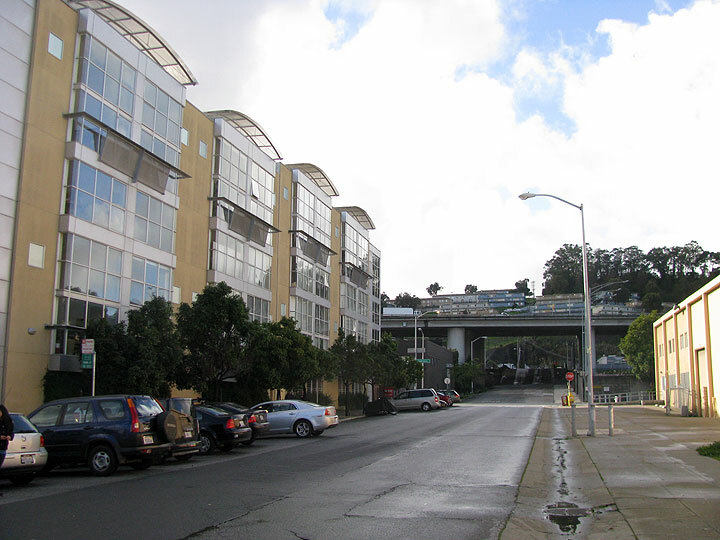 Interstate-280 in background, and behind that, on the hill, sits the Potrero Terrace Public Housing projects. The overall bias was toward encouraging affordable housing development while seeking to retain what remained of the area’s rapidly diminishing pool of blue-collar jobs. The plan redesigned portions of land formerly zoned primarily for industrial uses as mixed use, and two affordable housing zones were designated in which a higher percentage of the fees collected by the city would be dedicated to subsidize affordable housing production. Incentives were created to encourage developers to meet affordability requirements through land dedication to the city to provide more housing for people whose incomes were less than 80 percent of the area’s median. Developers would be required for pay a community improvement fee of $6 per square foot for residential property and $8 per square foot for commercial development to cover infrastructure costs. Land area dedicated to light industry would decrease by approximately 2 million square feet, and approximately seventy-five hundred to ten thousand units of new housing could potentially be built (Selna 2008). Activists, while not entirely pleased with the plan as approved by the Planning Commission, focused their energies on securing final revisions in a hearing before a generally sympathetic Board of Supervisors. Various revisions and amendments were recommended, and the board adopted the plan in December 2009. Over the period covered by this study, nonprofit organizations emerged as the de facto leadership cadre in the neighborhood-based resistance to gentrification in the city’s remaining working-class and immigrant neighborhoods. MAC’s success derived from four interrelated factors that would, for a period of time, converge and serve to create a context of viable neighborhood resistance. One, MAC’s relations with key architects of the “land use Left” in particular, provided MAC with critical legal and technical resources. This was seen, for instance, in the synergies that developed between MAC and CJAH, which allowed the leadership of MAC to call on the accumulated knowledge built up over prior cycles of struggle in negotiating complex and often arcane land use codes. Second, MAC’s constituent organizations shared a commitment to move beyond service models in favor of organizing within low-income Spanish-speaking neighborhoods. Third, nonprofit organizations provided a set of organizational resources that are essential, but often overlooked, aspects of capacity building of movements centered in lower-income working-class neighborhoods: buildings and meeting spaces in central locations, access to computers, communication technologies, and, most important, dedicated staff time. Fourth, MAC was able to mobilize the rhetoric of social justice predicated on the rights of working-class, often immigrant, residents to assert occupancy rights on a nonpropertied basis. In so doing, the leadership evoked a variant of a radical communitarian populist strand of political discourse that called for greater self-governance and rights to local self-determination that built on, and extended, rhetorical value frames that had motivated prior cycles of neighborhood opposition. Emphasis on base building and political development among MAC’s constituent organizations reflected recognition of the limits of service models in addressing the underlying causes of inequality and exclusion. Mission Housing had been moving toward a more explicitly community-based organizing focus for some time prior to the live-work boom. First, by the early 1990s Mission Housing was confronting increased nimbyism among home owners over the construction of low-income housing.3 Objections often had anti-immigrant and homophobic undercurrents, indicating the need for a greater commitment to political organizing on the part of nonprofit developers (Quezada 2002). Similar shifts were taking place on St. Peter’s Housing Committee. Formed in 1985, St. Peter’s had been founded with an explicit commitment to provide peer-based services and political organizing to address the needs of low-income tenants in dealing with landlords. St. Peter’s sponsored neighborhood marches and tenant delegations to landlords’ homes. Also, the committee carried out acts of civil disobedience to protest unfair treatment. Success in procuring funding from various city agencies, the Mayor’s Office of Community Development in particular, as well as securing foundation grants to fund the expansion of housing and counseling services, had the effect of transforming St. Peter’s into a direct service organization with the attendant loss of its prior focus on leadership development and direct action (Pagoulatos 2002). The limits of this service-oriented focus became readily apparent as the real estate boom began to displace immigrant tenants. The result was a deliberate reorientation of strategy away from a service model in favor of an organizing model. Nick Pagoulatos was hired as the housing committee’s executive director, and new staff was hired to engage in indigenous leadership development through peer-based training of tenant counselors and building-based organizing drives. St. Peter’s strove to build and expand its membership base and to provide forums for garnering direct input from low-income immigrant residents concerning their housing needs. St. Peter’s, in an alliance with Mission Agenda and Mission Housing, launched an organizing drive in the Mission’s numerous SRO hotels to develop indigenous leadership capacity and tenant-based organizations to identify issues of common concern to tenants (Pagoulatos 2002). This renewed commitment to community organizing ultimately proved unable to successfully solve the problems of political accountability or to provide a basis for sustaining popular engagement. In large part, the failure to sustain a broad-based movement reflects the waning of neighborhood mobilization in the wake of the dot-com collapse. The irony is that the success of MAC in setting the parameters of the community planning process tended over time to elevate its leadership into a cadre of expert planners charged with mediating interactions between the community and local government officials. The leadership was transformed from raucous outsider to the agent articulating community grievances in interactions with public officials. The result was a new, albeit provisional, stasis: Recognition was extended to neighborhood organizations while the planning bureaucracy continued to reserve the right to draft and issue any final recommendations. This established a more narrowly circumscribed range of issues that were accepted, however grudgingly on the part of the more militant leadership factions, as delineating the legitimate scope of future deliberation. The easing of the immediate sense of crisis led to a waning of neighborhood mobilization. Movement activists who were transformed into a cadre of experts became increasingly immersed in the technical details of the planning practice. Activists’ ongoing interactions with the land use planning apparatus trained them to speak in the language of planning discourse, as seen, for instance, in the rhetorical style of the People’s Plan, which is largely identical to a city planning document in terms of tone and format; it is vague on specifics, nonbinding, and technocratic. Priority policies in the plan are stated in a manner that is openended—in other words, suggestive of broad-based goals and objectives without specifying any strict mandates or enforceable affordability requirements (Mission Anti-Displacement Coalition 2005). Struggles in San Francisco need to be interpreted in a manner that remains cognizant of both structural constraint and the processional, open-ended nature of the political process. Recognition of the immanent character of these democratic demands should not obscure the ultimately compromised outcomes and overall pattern of failure when outcomes are evaluated against stated objectives. Opposition remains fragmented, and the progressive movement in San Francisco has failed to unify and cohere the various neighborhood and affordable housing forces around a common platform or program. This points to the limits of a neighborhood-level, constituency-specific focus and the need for developing a broad-based political system that could potentially bring a more democratic and participatory approach to the regulation of urban development. Excerpts from pages 88-75 and pages 85-91 from Local Protest, Global Movements: Capital, Community, and State In San Francisco by Karl Beitel. Used by permission of Temple University Press. © 2013 by Temple University. All Rights Reserved.